Open the can of chipotles and remove half of the chiles. Set the can aside to use later. In a large Dutch oven, heat the oil over high on the stove top. Once hot add the short ribs and brown for 2 minutes per side, for a total of 4 minutes, and set aside. This should be done in 2 batches. Remove the pan from the heat. Add the onions and garlic and off at the heat for two minutes. Lower the heat to medium and add the pan back to the stovetop. Pour the beef stock into the pan and deglaze. Be sure to scrape up any browned bits on the bottom of the pan. Add the chili water, half of the chipotle chilies with all the sauce from the can, 1 teaspoon kosher salt, cloves, oregano, cumin, honey, and bay leaf to the pan. Stir well. Increase the heat to high and bring to a boil. Add the short ribs back into the pan. Cover and place in the oven. Cook at 350 degrees for two hours. Remove the pan from the oven. 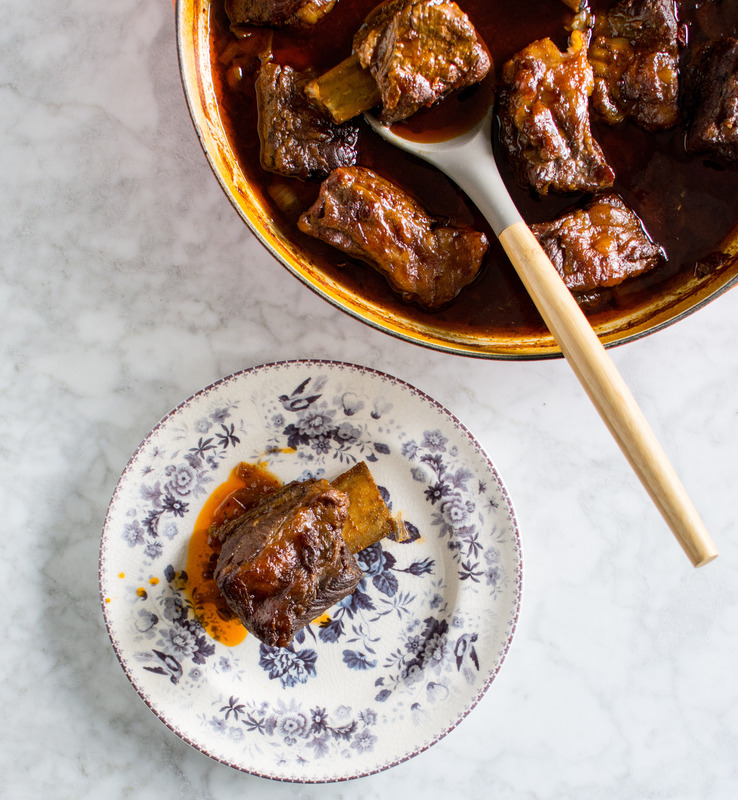 Remove the short ribs from the pan and place on a rimmed cutting board. Cover the short ribs with foil and let rest for 10 minutes. Meanwhile, skim off the fat that has collected on top of the cooking sauce. Serve the short ribs with rice topped with adovada sauce and chopped cilantro. This entry was tagged adovada, adovada short ribs, chiles and short ribs, dallas food blog, dallas food blogger, how to roast short ribs, short ribs, texas food blog, texas food blogger. Bookmark the permalink.